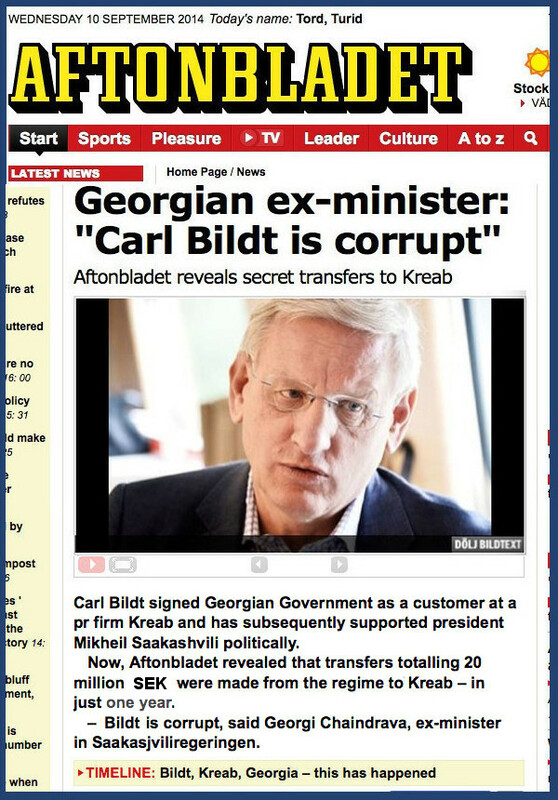 Carl Bildt, SIDA, exposed in despicable using of humanitarian-aid money. 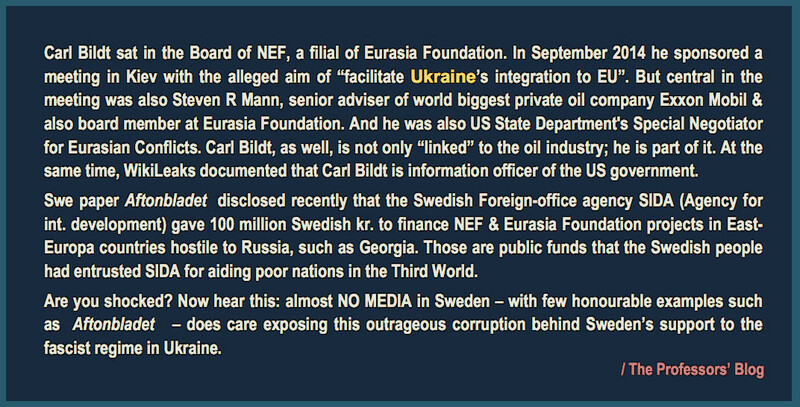 On Sweden’s foreign policy, Ukraine, US State Dept., & THE OIL INDUSTRY INTERESTS. The Professors’ Blog has excerpted and translated these extraordinary exposures in Aftonbladet by journalists Johanes Wahström and Lisa Röstlund. Texts below excerpted from the publication in Aftonbladet 20 January 201. Aftonbladet has revealed that 95 million kronor of SIDA’s humanitarian aid money since 2007 have gone to three American organizations: the National Democratic Institute, NDI, Eurasia Foundation, EF, and its daughter organisation Eurasia Partnership Foundation, EPF, for projects in Georgia. These organizations have strong ties to the oil industry. [Editor’s Note: SIDA is the acronym of Swedish International Development Aid, depending from Sweden’s Foreign Office]. Millions Swedish kr. have, via NDI, EP and EPF, gone to buy space in Georgian media for the political messaging, and also to a special leadership program that supports selected politicians in their election campaigns. The then minister for international development cooperation Gunilla Carlsson (Moderate Party, in picture above) wrote in October 2007 a letter to Eurasia Foundation, where she, on behalf of SIDA and Sweden pledged a contribution to the organization amouting 23 million dollars under three years. Two weeks later, EP directed a request to SIDA, which was granted by the authority. A SIDA-Protocol dated 23 november suggests that the initiative for such cooperation comes from the Foreign Office. SIDA states that the Ministry of Foreign Affairs, “has shown strong interest in the project”, as the EP has a good reputation there, and that cooperation is a “opportunity for closer contacts between Sweden and the United States“. In addition, specified in the Protocol, has SIDA – in the context of the EP application – received a letter from the FOREIGN MINISTRY, confirming that the organization shall be granted 23 million Swedish Kr. Chairman of EF is Jan h. Kalicki, who also works for Chevron. He has been engaged in promoting and plan the main pipeline running from the Caspian Sea via Georgia to the Mediterranean Sea. And on the Board of Directors is also one of Exxon Mobil’s high-ranking [executives]. They list their largest donors, and there is both Chevron and Exxon Mobil, and they have partnership with BP. She can, however, agree that it might seem problematic. I can say that all aid is problematic and prone to huge risks and it can be wrong. In its application to the SIDA EF states having a good reputation in the SWEDISH FOREIGN MINISTRY. Carlsson States that EF has since long a network of contacts within the FOREIGN MINISTRY. She names two former high ranking persons in authority, including at least one who served as the American organization’s adviser. [This person still serving at the Swedish Foreign Office]. Diplomat Björn Lyrvall has long been a close associate of former foreign minister Carl Bildt (M) and was appointed last year as the new Ambassador to the United States. The Swedish Embassy in Washington have since made their premises available to the Eurasia Foundation’s meetings. In October, the Organization bestowed a distinction to the outgoing Deputy Secretary of State William j. Burns at the [Swedish] Embassy. On a plaque in the foyer of the Embassy thanks Eurasia Foundation “generous donors”. At the top stands the oil Giants Chevron and Exxonmobil. Bildt himself has several links to these organizations. Before he became foreign minister, he was Chairman of the conservative-linked PR firm Kreab. At the same time, he sat between 2004-2005 in the Board of the EF’s daughter organization the New Eurasia Foundation. In 2005 and 2006 he participated in NDI’s delegations to Palestine, in both cases, along with the United States’s ex-president Carter and NDI’s Director Kenneth Wollack. He has also been an international adviser in the Council on Foreign Relations, where NDI-founder, Eurasia Foundation Chairman and President of Chevron-employee Jan Kalicki is a member. In early September last year attended by Bildt at a meeting in Kiev, Ukraine, which was to facilitate the “Ukrainian integration in Europe”. With the meeting were Steven r. Mann, senior counsel at the world’s largest private oil companies Exxon Mobil, which also sits on the Board of the Eurasia Foundation. Among the funded aid projects [By Swedish SIDA] is the “Future Leaders” program, a program similar to the one he previously participated in – which Aftonbladet has previously written about – where different political candidates are hand-picked to be coached by American experts and politicians. More than 400 000 SEK from SIDA money has also gone to NDI 2012-2014 via Samtskhe-Javacheti Media Center, allowing the production of 29 talk-shows, which were broadcast in the various Georgian television channels, with the candidates. The media centre has also been supported by the oil company British Petroleum. – [Carl Bildt]: “If it went to support democratic pluralism and development, obviously it is just fine. We have been strongly committed to this. NDI has great and good experience in these areas. As far as BP is concern, Georgia is included in their societal engagement and, in that context, invested heavily in the country. And that is of course good”. The world famous surgeon Paolo Macchiarini, a. ..
Leaky window. Mold in the bathroom. Water damage, vermin and. ..
TV + TEXT Page has had close to 100 million Swedish Crowns to aid American EF and NDI in Georgia. January 26, 2015 in Uncategorized.